In my spare time (read: any opportunity I can *possibly* get), I babysit for 2 different families here in the city. It’s a win-win for us all… Both families need a reliable on-call babysitter for busy Manhattan weekends, and I obvi need some extra cash to survive here in the Apple. Babysitting is actually an awesome way to make some cash on the side; just ask a Cultural Care Au Pair, they’ll be able to tell you how good it is to make some money while you study. I came to Family 1’s house tonight to watch over their *darling* little one while they met some friends in the city. I always use my babysitting time as my window of ultimate productivity and “me” time because, let’s face it, sometimes it can be hard to get things done and find quiet time in a 1,000 square foot apartment filled with 4 people. I planned my entire wedding registry here, created my personal budget spreadsheet, and have even sorted and filed over 500 pages of magazine clippings into . I think i get more done in *this* apartment than I do in my own! I packed my giant Coach tote full of all my babysitting essentials for the night- laptop, planner, plastic coffee tumbler, and 5 bags of my newest addiction- Celestial Seasonings Cinnamon Apple Spice tea (no caffeine, 0 WW points, can’t get better than that!). After playing with their pooch for a bit (the baby was asleep when I got here, natch! ), I bunkered down on the couch to watch some football (Go Cardinals!) and do some serious WW recipe recon for the upcoming week. And then I spotted it. Sitting on the gorgeously distressed shabby chic coffee table. And I did. And I will never be the same. 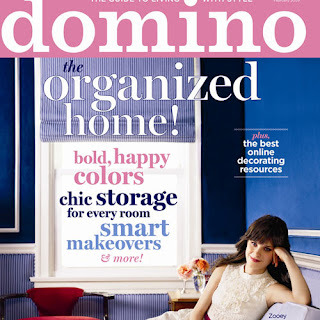 Ladies- I cannot impress upon you enough just how much you NEED to go out and get the latest issue of Domino (Feb 09). I can’t remember the last time I felt so giddy flipping through a mag. The article about labeling alone is sure to make any organization-savvy prepster do a little jump for joy.